Ed Helms and Rob Riggle Talk Girls Scout Cookies, Music & The Lorax | Breezy Mama Breezy Mama - Expert parenting advice, celebrity interviews, product reviews for kids, moms and babies and more! Is it just me or are Thin Mints and whatever those chocolate peanut butter ones are called on YOUR mind, too, right now? When interviewing Ed Helms and Rob Riggle to discuss their roles in The Lorax as the Once-ler and the uber bad Mr. O’Hare respectively, the mere mention of “Brownie Troop” and I had to ask about THE cookies. 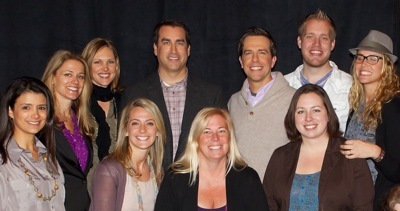 In fact, though I was with a group of amazing “mom bloggers” (and a dad, too! ), if you have read enough of my Breezy Mama celebrity interviews, you are likely aware that it was me who asked about the cookies, if they’ve ever lost it (as, in, couldn’t stop laughing) while working together, why Ed Helms is always busting out in song (a personal habit of mine) and, I just couldn’t resist, but had to know if they are aware of my new obsession, troll foot. Get the hilarious scoop from the two long time comedians on their roles in the movie based on the Dr. Seuss classic that opens on March 2 (tomorrow!!!) and more. Can you start by telling us about your history with the book The Lorax? Do you remember it when you were young? Ed Helms: Dr. Seuss had a really prominent sort of section on my childhood bookshelf, which is one of those decisions that your parents had to make. But, we, my brother and sister and I all just were totally enthralled with Dr. Seuss. And The Lorax in particular, for some reason — loved this book. And I didn’t even wait for a phone call about this movie. I hunted down Chris Melandandri [Producer] when I heard that they were making The Lorax and said, “I really want to be in this movie, I’ll take any part. I’ll just be a barbaloot or whatever, and I just want to be a part of it.” And I’m thrilled how it’s turned out. Rob Riggle: Yes. I love Dr. Seuss. I’ve always loved Dr. Seuss. Green Eggs and Ham, The Lorax, even Brown Shoe I think is one of them. Rob Riggle: Is it Brown Shoe? Rob Riggle: Well, there’s One Fish, Two Fish, but there’s also Mr. Brown. Ed Helms: Oh, the Places You’ll Go? Rob Riggle: I think something like that. So, yes, I too love them, and I read to my son at night. My daughter, she reads on her own now. But The Lorax usually makes a round. Rob Riggle: I have a seven year old daughter and a three year old boy. Have they seen the movie yet? Rob Riggle: No, but I am taking them to the premiere, and my daughter’s brownie troop. It’s a big deal for the girls. Are you doing that for the cookies? Rob Riggle: My wife is the cookie mom this year. So, she has had her hands full. I’ve got order forms in my trunk in case you want. We all have our own. Rob Riggle: I’m sure you all have. They should sell the cookies outside the premiere. Rob Riggle: That’s not a bad idea. I literally have gone around to Gary Sanchez [production company] and I’d put them up at these production companies, and we’re cleaning house — I have to be honest. Had you ever done an animated film? Is this your first? Ed Helms: Definitely a first for me. I’d done little tiny blurbs like on some Seth McFarland [Family Guy] shows, just like a little tiny one-off thing here and there, but nothing like this. This is a first. Rob Riggle: I’ve done animated on TV, but never a feature film. So, this is a first for me, as well. Rob, I read in the production notes that you went to your audition and were kind of joking that you were going to parks and yelling at the kids. Rob Riggle: I’m sure I said that. I have no doubt that I said that. Ed Helms: I’ve known Rob for, I don’t know, 10 or 12 years. Ed Helms: And I don’t know who this is. This is some nice cheerful guy. Rob Riggle: Normally, yes. I’m sure I did. Someone else mentioned that to me earlier. Someone said that I heard you went in and did a rant against the trees and all this stuff. And I think it’s totally in my wheelhouse that that happened. I don’t remember doing it. But, I am sure they said this character that you’re going to play is not very friendly to the environment, so I probably did a little rant for them, and they said, yes, that’s the guy. Your kids haven’t seen the movie yet, but do they know what type of character you’re playing? Rob Riggle: No. I’ll have to break it to them gently. A lot of the stuff I do, my kids can’t see. It’s just a fact. I would say almost everything I’ve done, my kids can’t see. So, the other day I did a role on Victorious [Nickelodeon] so my daughter could see it. And even that was a little risqué. Ed Helms: What is it? [Asking since he does not have kids… obviously, ahem]. Rob Riggle: Yes, it’s a show on Nickelodeon that a lot of kids like. So, anyway, I did that, and my daughter got to see it. It was a parody of the Breakfast Club. They call it the Breakfast Bunch. And so, I played the principal. I was like, I’ve got you for two weeks, Bender — that guy. Rob Riggle: So, my daughter and her brownie troop think I’m the meanest guy in the world because that character was kind of mean. And this isn’t going to help my case, either. This is not going to help my case. Ed Helms: You’ve all seen the movie, right? Ed Helms: [Deadpans] I was stunned at how accurately they captured Rob physically. Rob Riggle: Yes, the hair cut. I think they got it from some of my junior high pictures. So, Ed, you get to bust out in song in this movie, and then you’re always busting out in song on The Office, too. Is there a back story to always busting out in song? Are you going to bust out in song right now? Ed Helms: Perhaps I will. I just like it. I think it’s fun and silly and ridiculous and campy. And in this case, actually, there’s amazing music. John Powell [Composer], I mean, he just knocked it out of the park with the opening. We saw this together on Saturday for the first time, and it was–. Rob Riggle: –It was a little date, a little day date. Rob Riggle: Yes, John Powell is a genius, too, with that stuff because he got me to sing. I can’t sing. I can’t sing to save my life. Ask anybody on karaoke night. I’m the worst. And then, I had to sing as O’Hare [his character in The Lorax], which makes it even worse. But, he found a way to make it work. With your history of working together in various outlets, do you think you’ve perfected the heart of being in opposition of each other? Rob Riggle: Yes, that comes from a real natural place. Ed Helms: Yes, we don’t have to try it. No, our characters don’t even overlap. We’re sort of both villains in a weird way in this movie. Have you guys done something together where you just lost it, like you just couldn’t stop laughing? Rob Riggle: We’ve done stuff, the Upright Citizens Brigade Theater in New York. That’s where we started. And we’ve done many. I remember, we did shows at the Marathon, the UCB Marathon and we would crack each other up. Ed Helms: With Jason Sudeikis [Saturday Night Live]. The three of us were a little improv trio. Rob Riggle: For a while. Ed Helms: A little while. Rob Riggle: Those were good times. Ed Helms: You’re better at holding it together than I am. Rob Riggle: No, not so much. I’ve been doing shows over at the UCB in LA. There’s a UCB here in LA. And I’ve been breaking a lot lately. Ed Helms: Yes. I’m the worst. I’m hopeless. Rob Riggle: Wednesday nights, 9:30, if I’m in town, I’m over there. I sit back and just enjoy watching Ed work just like everybody else. I’m a fan, too. So, that’s good. Did the message of the film change at all anything in your daily life as far as environmentally, things you want to do better to help the environment? Ed Helms: [Deadpans] I don’t print out every email now, which I did for a long time. Rob Riggle: You had a real bad habit of doing that. Ed Helms: I had my assistant print out every email in triplicate. Rob Riggle: Every single one. Rob Riggle: Yes, that’s hideous. I like this story because you could tell this story 100 years ago or you could tell it 100 years from now and it’s still going to be relevant. And that is to take care of your environment. That’s good. It doesn’t matter what your political affiliation is, either. It’s good for people to hear. It’s good for kids to hear, and it’s good for old people to hear. Take care of your environment. Take care of the environment around you. Be a good steward. There’s nothing wrong with that message. And I think it’s a good one to get out there. Do you think you’ll do more voice work? Ed Helms: I will do as much as I can. I love it. Rob Riggle: I’ll take as much as I can get, as well. Ed Helms: To see this movie on Saturday was as if I had to kick myself after and say I’m part of that. That’s so cool. Rob Riggle: Yes and no. Ed Helms: Yes and no. I don’t really Tweet, but I am on Twitter. It’s Danny DeVito who takes a picture of his foot in different places, and he showed us his foot at the Super Bowl. Rob Riggle: That really is awesome. We just interviewed Danny DeVito, so if you run into him today, you’ll have to ask him to see the pictures. Mr. Ed Helms: And that’s literally all it is? Does he Tweet any messages with it or it’s just pictures? Mr. Rob Riggle: I love it.